Syllabus of the Online Course (Subject): Foreign Trade and Business in Bahia Salvador (Brazil). Learning materials in + Brasil Brasil Bresil. Bahia is the sixth Brazilian state in potential consumer and the largest economy of Northeast of Brazil, responsible for 33% of the gross domestic product in South America and more than 50% of exports. 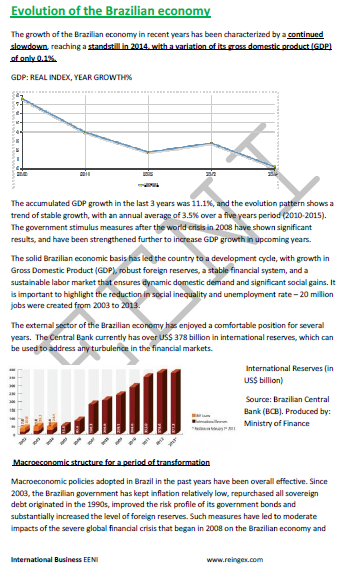 If Bahia were a Latin American country would be the eighth largest economy in the continent. Bahia is the second-largest tourist centre in Brazil. The Automotive sector is one of the most interesting in Bahia. Bahia has three ports - Salvador, Aratu, and Ilheus -. The State of Bahia also promotes customs dry ports implementation in towns like Barreras, Juazeiro, Itabuna, Feria de Santana and Victoria de la Conquista. Area: 564,692.67 square kilometres (6.64% of the Brazilian Area), 68.7% is a semiarid region, while the coast is 1,183 kilometres, the longest coastline of all Brazilian states. Metropolitan Region: Camaçari, Candeias, Dias D'Avila, Itaparica, Lauro de Freitas, Mother of God, Son Francisco del Conde, Simões Son and beheld Cruz. Odebrecht (Corruption scandal in 2017). Founded in 1944, the organisation Odebrecht works in engineering, construction, chemical, and petrochemical working in South America, North America, Africa, and Europe.